Going into the weekend I had somewhat vague plans of doing some baking, some sewing, some knitting, and a whole lot of cleaning. I did get a little bit of sewing done Saturday night but had to stop when I remembered that the time change had happened and I was somehow screwing myself over by staying up so late (ugh...why did I waste so much time on Ravelry before I started sewing??). I also got quite a lot of knitting done, but I don't think Nuvem looks any bigger or different. Other than that, I did nothing. Correction: my family did nothing. We were seriously a bunch of sloths all weekend long. Absolutely nothing was accomplished. We didn't even do dishes. No, that's a lie. Brett did do a few, but that's only because we needed something to eat dinner off of. Saturday was just a day of yuck so the Munchkin and I vegged out on the couch watching Disney Pixar movies galore. From time to time the Munchkin would grab toys and re-enact scenes from the movies and I spent a great deal of time knitting. We did break for rounds of living room bowling and tickle fights. That is, when the Munchkin wasn't The Kidlet of Terror. Man, oh man, was he ever grouchy on Saturday! I like to think the full moon on Thursday had something to do with it. The kid just didn't want to eat, wear a diaper or use the potty, didn't want to wear pants (which resulted in both of us not wearing pants for the majority of the day. Don't ask), and if you even looked at him in a weird way he'd freak. When Brett came home I made a beeline to the bedroom. I needed a time out! The time change messed us all up and so Sunday was a complete and total write off. Not only was Brett beyond exhausted from a loooong week full of very early mornings and super late nights, but the Munchkin's grouch factor went from the previous day's 6 to a full fledge 100. The Munchkin was so off, that he even took a nap! The only time he ever naps is when he's been riding around the truck for too long on errand day, and hasn't taken a proper nap in a bed since October! I didn't realize how tired I was either until Brett woke me up on the couch (with Nuvem still on my lap) to tell me that dinner was almost ready. The Munchkin was a bit of a grump still yesterday morning and no amount of coaxing could get him to change out of his pyjamas...or to put on pants when the pyjamas did finally come off, and so we never made it to his toddler group. Seriously, doesn't anyone else have a kid who has an issue with wearing pants?? I'm ready to start banging my head against the wall here! Luckily by the afternoon everyone was in a much better mood and the rest of the day went without incident. The only thing we managed to accomplish all Monday: grocery shopping. What did I personally manage to accomplish all day? I rediscovered a pair of rain boots that I haven't seen or worn in ages. Oh, and I got some yummy yarn in the mail. Ok, that's not really an accomplishment...it just makes me feel happy to hold new yarn. The dishes are still piled high (I think every single dish and piece of cutlery is dirty), baskets of laundry still need to be folded and put away (we won't talk about what's in the washer and dryer), and I swear something smells funny in the living room. Normally I would be a little upset that I had "wasted" an entire weekend, but you know what? I'm not upset at all. Not even a little stressed out. If anything, I feel somewhat blissful for having done absolutely nothing. In the pre-Munchkin days, there were several weekends where I don't even bother showering or wearing anything other than my pyjamas. I had missed those lazy weekends. A part of me feels like I should feel bad for being so lazy, but I think my friend Becky put it best: "it's not what you do, but how well you do it! If you embraced and relished your slothfulness, then it was an extremely well spent weekend and not at all what I'd call wasted". So...yeah...um...I did plan on vegging out all weekend. Mission accomplished! Yeah? Oh well, at least I got to knit away on Nuvem! I did kinda have a weekend mission to knit at least 50g of yarn. 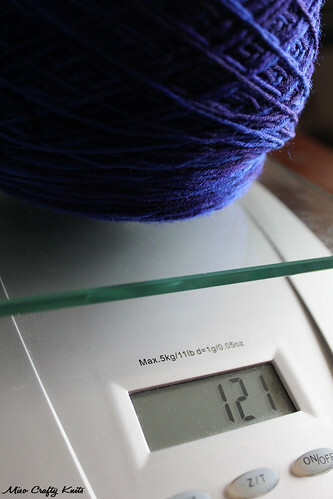 I started the weekend with about 170g and guess how much it weighs now? 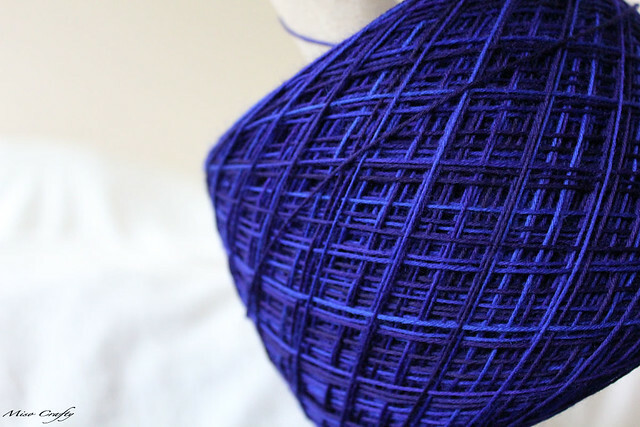 In the back of my mind I was unrealistically hoping that I could plow through and magically knit up 100g so that I could get started on the border. But this...this is good. This is a start. I don't mind this. Jeez, where am I getting this laid back attitude from?? I like it! I'm going to see how much I can knit today. I wonder if it's too much to ask to be able to get that number down to below 100? It's another blah day and I'm already on my third cup of coffee and need a break from chasing the Munchkin around trying to put pants on him. And before I can do any knitting, those dishes are calling my name...ugh, I'd call it the case of the Mondays but it's Tuesday! Le sigh. It's going to be one of those weeks. I hope everyone else had a good weekend!